You must create at least one journal in order to see anything in this block. You can allow the copying of your journal (entries). Choose this option wisely because once a user copied your journal content into their portfolio, it looks as if they had written the journal entries. This could lead to plagiarism. However, it can be used very nicely to create templates and to scaffold learning. Personal journals: You can include personal journals and journal entries in your own portfolios and in group portfolios. If somebody else changes the block configuration in a group portfolio, they will not be able to choose your journals or journal entries though. Only you can place them there. Group journals: You can display group journals and entries only in the group in which they were created. Institution journals: An institution’s journals are only available for inclusion in pages for that institution. Site journals: You can add site journals only to site portfolios. Display an entire journal on your portfolio page. Block title: The title for the block is chosen automatically from the title of the journal unless you provide a different one. Journal: Select the journal you wish to display. If you have many journals, you can also search for the one you want to use. Entries per page: Decide how many entries you want to display. Entries beyond this number are accessible via a navigation bar. If you share the page publicly in which you make an entire journal visible, your journal receives an RSS feed address to which your readers can subscribe in their favorite RSS readers. Once you have included the Journal block into a page, you can create a new journal entry directly from that block when you are in the Edit mode for the page. When you click the New entry button, you will be taken to your journal and a new entry is started for you. It is then added to the journal automatically. Display one journal entry on your portfolio page. Block title: The title of the journal entry is chosen automatically unless you provide a different one. Journal entry: Select the journal entry you wish to display. If you have many, you can also search for the one you want to use. You always also see the title of the journal in which the entry appears. Display recent journal entries across all your journals on your portfolio page. You can use this block also in group, institution and site pages. Journals: Select the journal(s) from which you wish to display the latest entries. If you have many journals, you can also search for the one(s) you want to use. Entries to show: Decide how many entries you want to display. If you have multiple journals, you can display recent entries from all of them. Once you included the Recent journal entries block into a page, you can create a new journal entry directly from that block when you are in Edit mode for the page. When you click the New entry button, you will be taken to your journal, and a new entry is started for you. It is then added to the journal automatically. If you enabled multiple journals and selected more than one for which to display recent journal entries, you will see a slightly different display. Choose the journal to which to add your entry from the drop-down menu. Click the Add button to create your new entry. Display tagged journal entries across all your journals on your portfolio page. Display entries tagged with: Choose the tags that you want to use to filter all your journal entries for display. Only tags you used on journal entries are available. You can include or exclude tags. See below for more information. 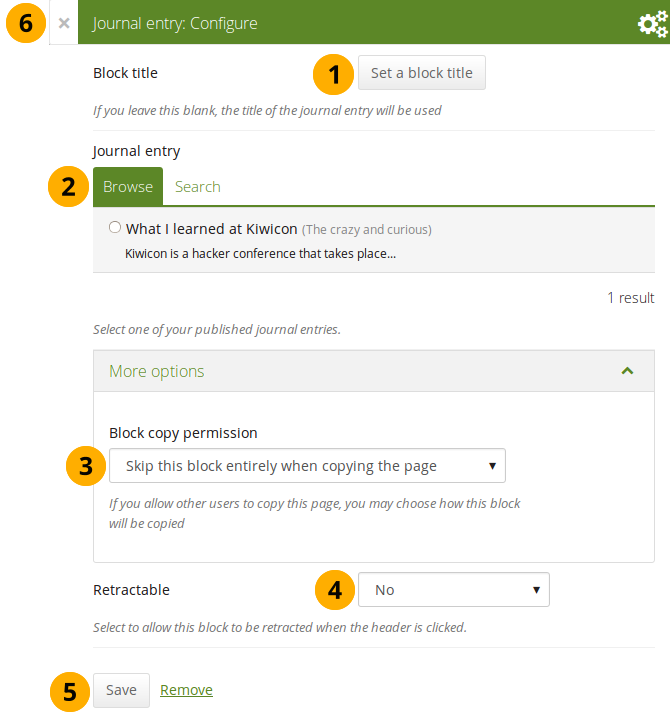 Others will get a copy of the block configuration: The block is copied, but not the journal entries. When the user creates journal entries with the tag(s) used in the block, they will be displayed. Items to show: Decide how many entries you want to display. Show journal entries in full: If you switch this option to “Yes”, your journal entries will be displayed. Otherwise, only their titles are shown and people need to click on them to read your entries. Once you have included the Tagged journal entries block into a page, you can create a new journal entry directly from that block when you are in Edit mode for the page. When you click the New entry button, you will be taken to your journal and a new entry is started for you. 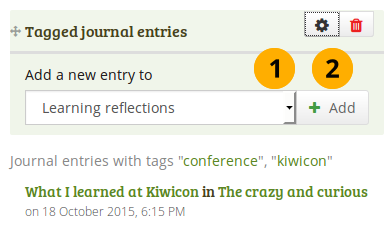 It is then added to the journal automatically with the tag(s) whose journal entries are displayed on the page. If you enabled multiple journals and have a minimum of two journals, you will see a slightly different display. Click the Go button to create your new entry. When you want to choose which tags to use in your block, you can select multiple tags to include or exclude. That way you can be very flexible in which entries to display in your block and which ones to leave out. You must have tagged your journal entries beforehand. If you haven’t done that, please go to your journal entries and tag them. You can find them under Content → Journal(s). Click in the text field for the tag entries. You can start typing the tag that you are looking for if you know it. The result list that you see underneath gets shorter based on what you type. If you want to exclude a tag, type the minus sign and then the tag. In the tag result list, click the tag that you want to include. If you want to exclude a tag, type the minus sign and then select the tag. Once the tags are in the field, you can see directly which ones are included and which ones are excluded. Tags that are excluded from your journal entries are displayed in red. Tags that your journal entries must have are displayed in light grey. You can remove any tag by clicking the x to the left of it. 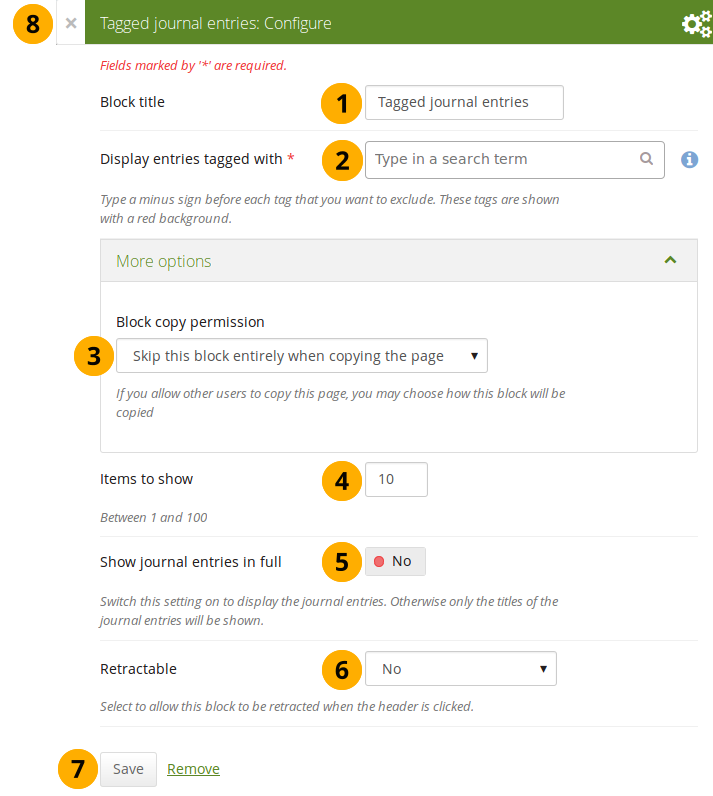 When you display your page that has a tagged journal entries block, you see which tags are used to filter your journal entries. 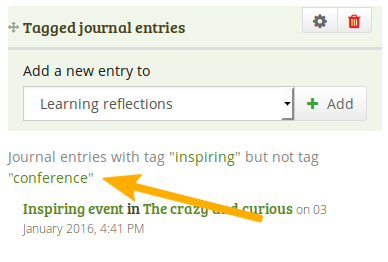 For example: Journal entries with tag “learning” but not tag “conference”. You can add multiple tags to limit the results as well as indicate which tags you want to ignore. If you select multiple tags, a journal entry must match all selected tags in order to be listed. 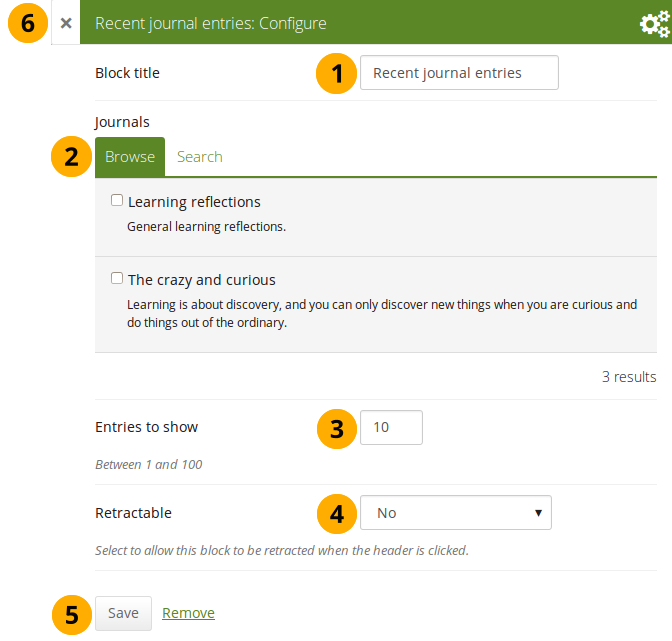 the tag “education”, all journal entries would be displayed in the block. the tags “learning” and “language”, journal entries 3 and 6 would be displayed, i.e. the entries that are tagged “learning” and “language”. the tags “education” and “language”, journal entries 3, 6, and 9 would be shown, i.e. the entries that are tagged “education” and “language”. You can also exclude tags from the results by putting a minus sign before the tag you want to select. the tag “learning” and exclude “formal” (exclude the tag by typing “-formal” without the quotation marks), journal entries 4, 5, and 6 would be displayed. You search for journal entries tagged “learning” and not “formal”. the tag “nonformal” and “education” and exclude “music” and “language” (exclude the tags by typing “-music -language” without the quotation marks), journal entries 4 and 7 would be shown. You search for journal entries tagged “nonformal” and “education” and not “music” and not “language”. The operators and and not are two of the so-called “Boolean operators”. The Mahara manual is licensed under your choice of Creative Commons Attribution-ShareAlike 3.0 unported or GNU General Public License version 3 or later 2011-2019 Catalyst IT and others. Last updated on Mar 28, 2019. Created using Sphinx 1.8.1.